As the industry’s leading supplier of high-quality flat rolled steel, Grand Steel strives to meet – and exceed – customer expectations. We’ve outfitted our massive facility with cutting edge equipment that allows us to conform to exacting specifications. Whether you need cold rolled, painted, galvannealed, electrogalvanized, or aluminized steel, you can absolutely count on us to deliver. In addition to this, we’ve trained all of our employees to ensure that they are capable of handling any and all requests. If you’ve been searching for a steel service center that is quality-focused, timely, and dependable, you can be confident that you’re in the right place! Steadfastly committed to rising to our customers’ challenges, we’ve attained ISO 9001:2008 certification, which indicates that we’ve displayed a dedication to the continual improvement of our products and services. Because of this, you can count on us to supply you with high quality products and fewer variations. We understand exactly how important repeatability and consistency is, which is why we adhere to strict quality standards. 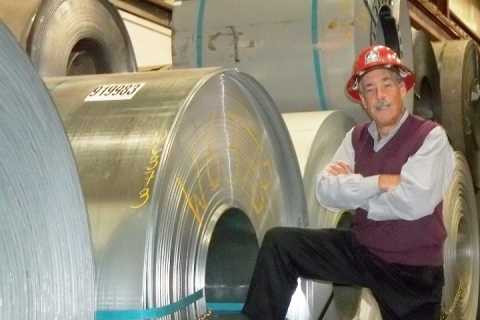 With the ability to measure and thoroughly inspect every product that leaves our facility, you can be certain that the flat rolled steel that you’re receiving meets your exacting standards and specifications. With over a century of combined experience, Grand Steel is well positioned to deliver on your expectations. Our well-trained team can rise to any challenge placed before them. Whether you’re facing a tight deadline, a difficult set of specifications, or a high quantity order, you can rest assured that our team will do everything in their power to assist. If you’ve been searching for a dependable, time-tested provider of the industry’s highest quality flat rolled steel, contact us today to discuss your needs and learn how we can help.